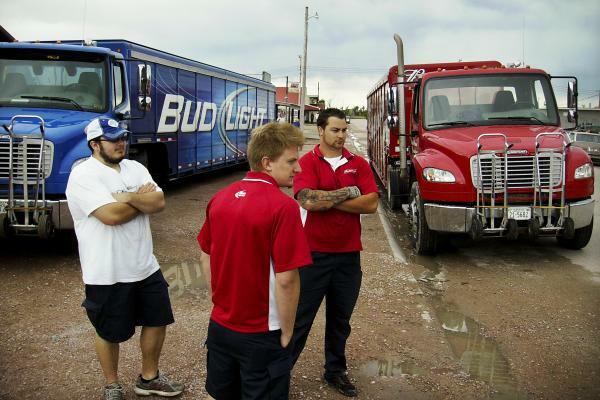 Oglala Lakota activist Debra White Plume (left), tribal president Bryan Brewer (center) and other protesters create a blockade to prevent trucks from delivering beer to a liquor store in Whiteclay, Neb. The town, which borders the Pine Ridge Reservation, has been the site of recurring protests over alcohol. Beer delivery truck drivers wait in Whiteclay on Monday as protesters block their way. Liquor stores in the town sell millions of cans of beer annually to residents of the reservation. 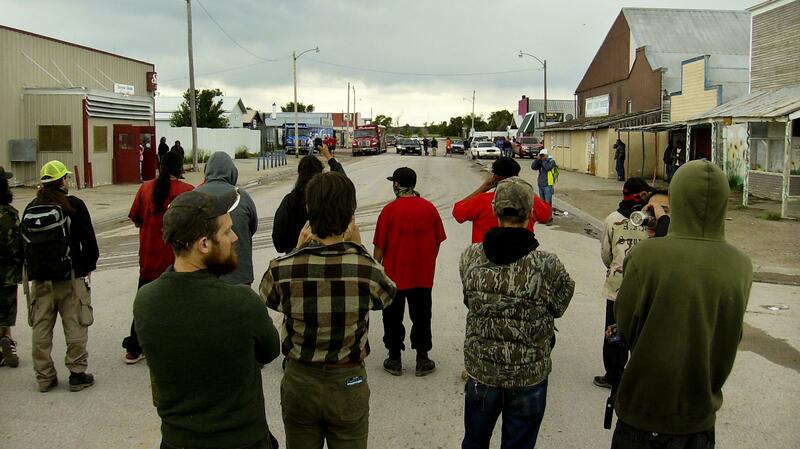 Protests against alcohol deliveries are a recurring event in Whiteclay. Authorities have accused the protesters of vandalizing beer trucks, while activists say a liquor store owner has hired people to intimidate them. At the Pine Ridge Reservation just outside the town of Whiteclay, Neb., an upside-down American flag flies on a wooden pole next to a teepee. About 60 people gathered here Monday to protest as beer truck drivers unloaded cases into a Whiteclay liquor store a few hundred yards away. Whiteclay has one paved street and four liquor stores. Alcohol is banned on Pine Ridge, but alcoholism is rampant here and the unemployment rate hovers around 80 percent. The town sells the equivalent of about 5 million cans of beer annually — mostly to impoverished tribal residents. Homeless Native Americans who drink and sleep in Whiteclay can outnumber town residents. The protesters want to block further alcohol deliveries, and are using blockades and marches like this to try to curb beer sales. 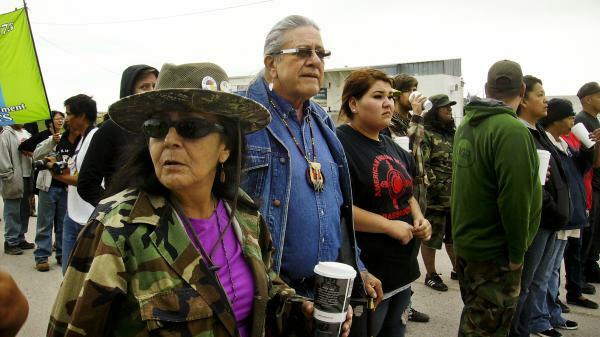 Oglala Sioux Tribal President Bryan Brewer is among the protesters. "As leaders we should be ahead of the people," he says. "We need to support our activists who are stepping up and confronting this issue." Sheridan County Sheriff Terry Robbins confronts the blockade, and Brewer steps up. He says the beer trucks "are not going in today. ... Any other day, but not today." "Yes, they are," the sheriff replies. "I'm sorry, but they're not," Brewer says. "Don't argue with me." Brewer is ultimately arrested. As the crowd resists, an officer puts a stun gun to a protester's neck, and the conflict quickly escalates into shouting and shoving. Brewer remains calm and tries to pacify those around him. He is charged not for blocking traffic, but for an outstanding warrant on a bad check. Jamian Simmons, the county prosecutor, says the charges were dropped once Brewer made good on the check. While Monday's conflict passed without major violence, Simmons says that wasn't the case during a similar blockade last month. "[The protesters] used axes and sledgehammers to smash up the [delivery] trucks," she says. "There were threats made to the drivers that if they came back to Whiteclay, they would be killed. Individuals were flashing knives." Protesters argue that attacking delivery trucks is not an act of violence. They also accuse a liquor store owner of arming local thugs with baseball bats to intimidate them. Store owners and beer distributors refused to comment for this story. As the protest on the Whiteclay-Pine Ridge border continues, the tribal council approved a permanent checkpoint at the border to try to stem the flow of liquor onto the reservation. But the council is also putting prohibition itself up for a referendum. Council member Robin Tapio backs efforts to legalize alcohol here. "Alcohol is a choice that we make," she says. "So I did not support the [protest] up there because I just don't feel it's right." Protest leaders like Olowan Martinez harshly criticize council members who want to allow alcohol on the reservation. "They're cannibals because they want to profit," she says. "They want to gain something off of the misery of their own. To me that's a form of cannibalism." Strong words that underscore the strong feeling here. Following council president Brewer's arrest, Martinez and others maintained the blockade and the beer trucks eventually turned away. Protesters may have won the battle this week — but the beer trucks are likely to roll into Whiteclay again, and this conflict shows few signs of ending soon. Copyright 2014 South Dakota Public Radio. To see more, visit http://www.sdpb.org/radio/. From NPR News, this is ALL THINGS CONSIDERED. I'm Robert Siegel. On the Pine Ridge Reservation at the southern edge of South Dakota, alcohol is banned. But just outside the reservation, the tiny border town of Whiteclay, Neb., sells as much as 5 million cans of beer a year. Most of the buyers are impoverished tribal residents. Earlier this week, the Oglala Sioux tribal president was arrested while taking part in a blockade of beer-delivery trucks in Whiteclay. Activists have been clashing with liquor store owners and the conflict is escalating, as South Dakota Public Broadcasting's Charles Michael Ray reports. CHARLES MICHAEL RAY, BYLINE: Just outside the town of Whiteclay, an upside-down American flag flies on a wooden pole, next to a teepee. A group of about 60 people is gathered here. A few hundred yards away, beer-truck drivers are unloading cases into a local liquor store. This group aims to march into town and block further deliveries. Oglala Sioux tribal president Bryan Brewer is among the protesters. BRYAN BREWER: As leaders, we should be ahead of the people. And we need to support our activists who are stepping up and confronting this issue. RAY: Alcoholism on Pine Ridge is rampant. The unemployment rate here can top 80 percent. Whiteclay, which borders the reservation, has one paved street and four liquor stores. Homeless Lakota who drink and sleep here can outnumber town residents. Activists are using blockades and marches like this, to try to curb beer sales. BREWER: They're not going in today. BREWER: Any other day, but not today. BREWER: I'm sorry, but they're not. Don't argue with me. RAY: Brewer is placed under arrest. The crowd resists. One officer puts a taser to a protester's neck, and the conflict quickly escalates into shouting and shoving. UNIDENTIFIED PROTESTER: Hey, keep your hands to yourself! RAY: President Brewer remained calm during his arrest, and tried to calm those around him. It turns out that Brewer was not charged for blocking traffic, but had an outstanding warrant on a bad check. The county prosecutor, Jamian Simmons, says the charges were dropped after he made good on that check. This conflict passed without major violence, but Simmons says this wasn't the case last month. She accuses some protesters of attacking beer-delivery trucks during a similar blockage. RAY: Protesters deny that attacking a beer-delivery truck is an act of violence. They accuse a liquor store owner of arming local thugs with baseball bats, to intimidate them. Store owners and beer distributors refused to comment for this story. As the protest on the border continues, the tribal council approved a permanent checkpoint at the reservation border, to try and stem the flow of liquor onto Pine Ridge.The council is also putting prohibition itself up for a referendum vote. Council member Robin Tapio backs the effort to legalize alcohol here. ROBIN TAPIO: Alcohol is a choice that we make, you know, so I did not support the walk up there because I just don't feel it's right. OLOWAN MARTINEZ: They're cannibals because they want to profit. They want to gain something off of the misery of their own. To me, that's a form of cannibalism. RAY: Strong words that underscore the strong feelings here. Following president Brewer's arrest, Martinez and others held the blockade, and the beer trucks were turned away. RAY: Protesters may have won the battle this week, but the beer trucks are likely to soon roll into Whiteclay again, and this conflict shows few signs of ending soon. For NPR News, I'm Charles Michael Ray in Rapid City, S.D. Transcript provided by NPR, Copyright NPR.